I'm back! 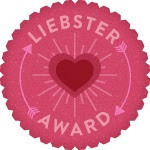 For the first two months of this year I was pretty pleased with myself on how many blog posts I had managed to do, sure it helped that in that time I had had two weeks off of my day job. A few weeks back I did begin to think it would be nice to take a small break from here as I was feeling slightly burnt out. 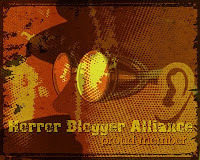 Well it turns out the Gods, or maybe Demons were listening to me, and they were happy to assist me, but in typical Faustian fashion there was an unforeseen catch to my blog holiday, one which led my break to not be the happiest one. Still I have seen fit to return today and may I never wish for a blog holiday again anytime soon as the payment is too high a price. 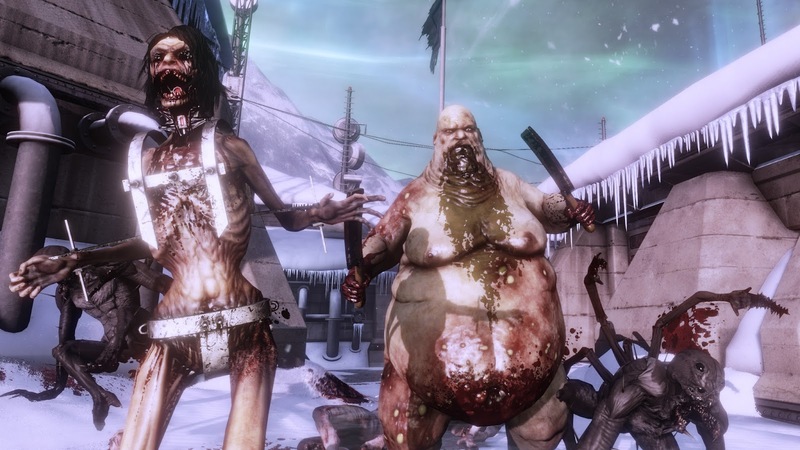 With that preamble over onto the actual point of this blog post; a review of Killing Floor 2. I have often waxed lyrical about my love for the Zombies mode in the Call of Duty series of games, the wave based survival against hordes of undead is so much fun in co-op mode. Where that mode was just one section of the latest Call of Dutys in Killing Floor 2 for better or for worse that is all there is. Until I had a quick look on Wikipedia before writing this post I wasn't even aware there was a story for the game, but it turns out there was. In Killing Floor (the first game was only released for PC) there was a biological outbreak from a medical research company called Horzine that led to zombie like creatures named Zeds sweeping across Europe. 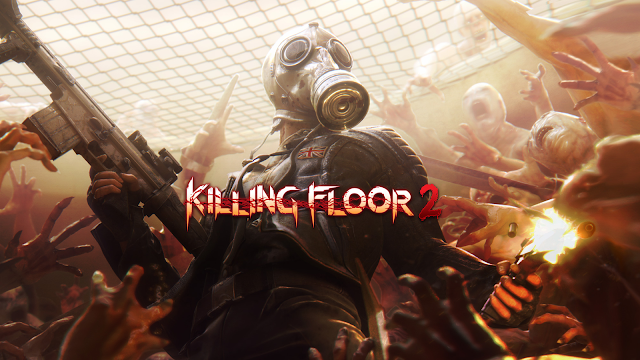 Killing Floor 2 takes place a month after the initial outbreak with the situation spreading outside of Europe. That's about it for the plot as aside from incidental details in maps you go to, and character briefs this is all about wave based survival and not much else. There are two different modes to be had here, the first mode is either you on your own, or with up to five other players. You have to work together to survive either four, seven, or ten waves against increasingly numerous monsters, culminating in a boss round. 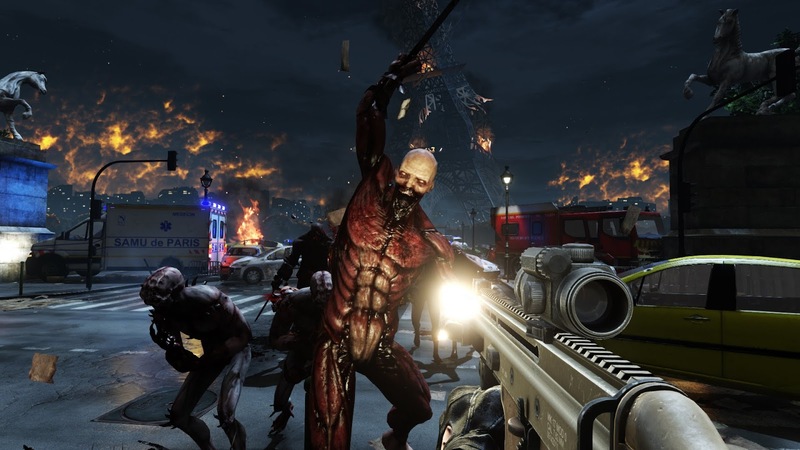 The other mode is near identical except half the players play as normal, the other half are on the Zeds side, spawning as a random enemy they are tasked with trying to kill the humans. Now a game such as this that has no real beginning or end means I had to pick a point where I would write a review. To be honest I haven't even tried the Versus mode, sticking just to the first mode I have successfully completed four and seven round modes on Normal. To begin with you pick a 'perk' which is actually a class and affects slightly your abilities and what weapons you start with. The Firebug class for instance starts you off with a flamethrower and with an increased resistance against fire damage, the SWAT class as another example gives you greater experience for sealing up doors. There are classes focused on close up damage, ones for general shooting (Commando for example which also gives you the rather useful ability to see enemies health bars), and ones that are more attuned for support, able to either heal other players better, or supply them with additional ammo should the need arise. Each class has it's own mechanics that level it up better, though using other classes weapons and abilities grants them some additional XP. 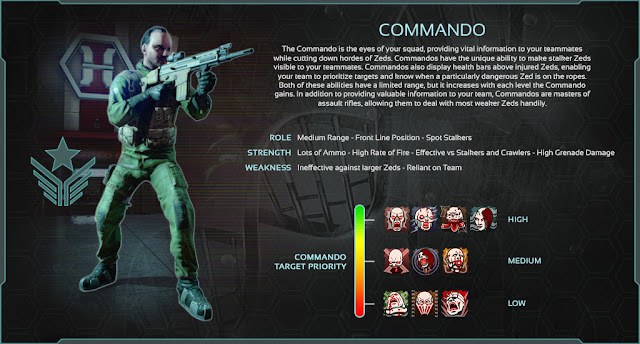 It seems there are 25 levels to rank up through, every five levels you get an additional boon to your chosen class (at level 15 the Commando gets the option of a 25% increase to starting health and armour). On the more cosmetic end you can choose from a wide variety of characters, ranging from Knights, to Dutch DJ's, Australian rock-a-billies and more. These characters all have their own unique dialogue and can be customised so even if there are multiples of the same character in any one game they can still look quite different. With a whole game devoted to the wave based style of gameplay there needed to be more maps than the five or six you get over the course of a Call of Duty game. There are still maps being added to Killing Floor 2, the latest was released as late as January, on an awesome note these additional maps are completely free. There are around 13 as of now that cover a whole range of locations, some feel more game like than others but all are full of detail and there is a nice range of small, medium and large maps. Farmhouse is the smallest of the current maps, it as the title suggest takes place in and around a multi-floored farmhouse and includes a big barn area too. Outpost is a good example of a medium sized map, and happens to be my best friends favourite, it takes place in a The Thing style Arctic research based. Voltor Manor on the other hand is huge, a giant Gothic Resident Evil manor complete with basement and surrounding gardens. There is a map that takes place on the streets of Paris, ones set in laboratories, catacombs, evacuation points, even one that seems to take place in Hell! They all play roughly the same, after each wave ends you follow a blue marker to a shop booth where you can spend money earned on replenishing your armour, buying bullets, and eventually buying better weapons with which to kill the Zeds. 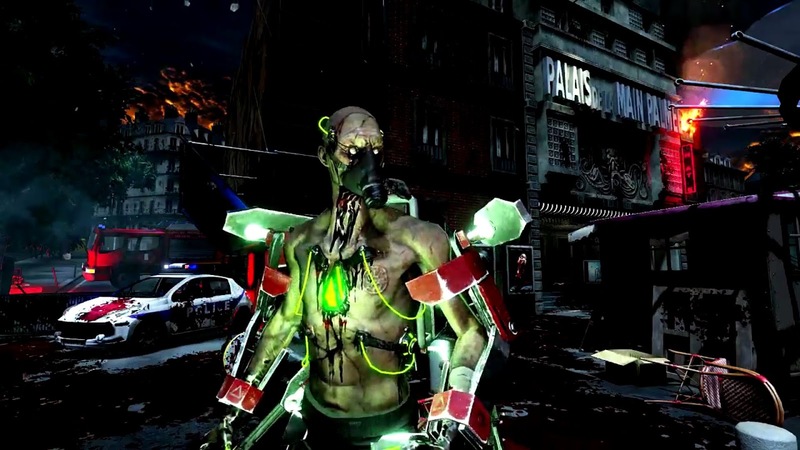 Initially the main enemy type is the default Zed; a slow moving, weak zombie like creature, each round more and more different enemy types show up, all with their own unique ways of attacking. Sirens are female Zeds whose howl causes huge damage if you are near them, then there are invisible Zeds, huge armoured ones that cane your energy should they get to you, ones armed with swords, with missile launchers, even one that wields a rather nasty chainsaw. To fight these you can purchase a load of different weapons, the usual assortment of machine guns, rifles, pistols and shotguns. Weapons are maybe the weakest part of Killing Floor 2 as nothing really feels too unique, I found the few weapons I really got on with for my class and just stuck with them. Shoot enough enemies and you get a kind of bullet time where everything slows to a crawl, each kill in this mode extends it so can be cool to kill lots of undead this way, especially with grenades that rip apart the ghouls in gruesome fashion. Killing Floor 2 is at it's very best when you are swamped with enemies, when all around you they are jumping down from above, crawling out of vents and charging. In single player this can get a little bit frustrating at times, you seem to always be reloading your weapons, it seems though the more people playing the more fun it is. With more players you get to really work as a team to survive the Hell you have created. Saving team mates from getting attacked from behind, working together to take down harder foes, healing each other, all makes the experience all the more fun and exhilarating. Me and my friend have had loads of fun playing alone, yet even with four strangers added to the mix things stay just as fun as everyone is doing there part. While the game is a lot of solid fun there are some negative sides that are too apparent to ignore. The biggest one for me is the bosses...for reasons unknown there are only two different ones, a huge cyborg armed with a Gatling gun is one of them, the other a more scrawny scientist who specialises in poison attacks. With all the effort gone into making the maps so varied it is a weird shame there are only two bosses. The game even acknowledges this in the on screen text that appears at the start of a boss round. My second issue are the cosmetic items you can potentially get. On occasion I was gifted a crate that I was told I needed a key to open. Well it turns out the only way to get a key is to buy one with real money which kind of stings when you already have a game that some would say is a little short on stuff to do. Earning clothes and accessories for your characters would have been a nice incentive to play, as it is I am not going to spend money on that side of the game. For me personally this was an easy game to review (as you can tell from my never ending wall of text that constitutes this review), however my recommendation is based on you playing this co-operatively, if you intend to play this solo then the fun factor will be reduced a lot, I've actually dissuaded people I know from buying this once I realised they only planned to play it solo. It would have been nice to get a decent single player campaign but I understand why there is not one as it is intended for co-op play. I would also say if you play PC games then get that version as it is full of custom made maps that are simply not available on the PS4. Killing Floor 2 is a nice alternative to Zombies, and on the PS4 there isn't really much else similar out there.